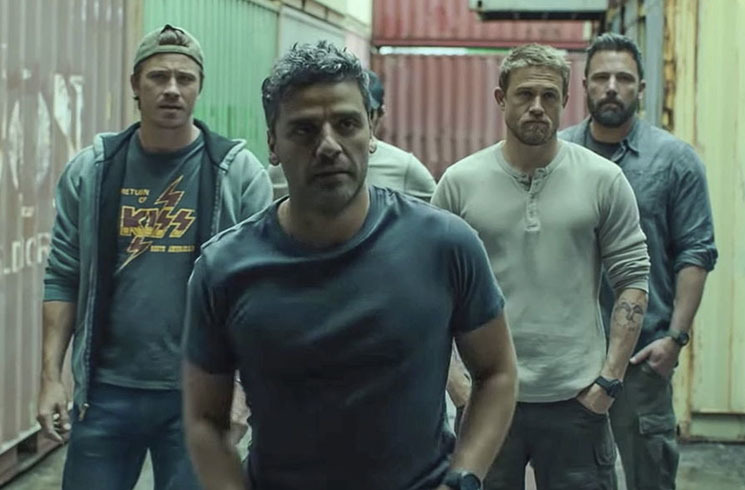 There's no honour among thieves, but don't tell that to the moralizing mercenaries of Triple Frontier. The film follows a group of ex-Special Forces operatives carving out civilian lives away from armed combat. Things change when their army buddy Santiago "Pope" Garcia (Oscar Isaac) comes out of the woodwork with a lucrative scheme to take out a South American crime lord. These honourable bros are initially hesitant — particularly Tom "Redfly" Davis (Ben Affleck), who is now a struggling realtor with a family to support. But after beating the audience over the head with pro-army propaganda about how soldiers don't get paid enough, everyone agrees to the plan to make a quick buck. In South America, it quickly becomes apparent that this mission is a little shadier than Pope initially suggested. Rather than a government-sanctioned mission to take down a crime boss, this is a full-blown heist, with millions up for grabs. After more hemming and hawing about morality, plus additional reminders about how soldiers deserve to be paid more, everyone agrees to murder the mobster and take his money. It's Robin Hood with an assault rifle. For a movie whose characters spend so much time worrying about "doing the right thing," Triple Frontier doesn't bother examining its own message. It dubiously glorifies the military, as the dudes listen to Metallica and give macho speeches about the supposed nobility of killing people while wearing the U.S. flag on their sleeves. South America is depicted as a criminal wasteland, where literally every character is a gang member or a victim; even when they meet a group of remote farmers in the foothills of the Andes, they turn out to be growing cocaine. There's only one female role (Adria Arjona), and her primary character trait is that she's attractive — something the male characters remind us of repeatedly. But as unconvincing as all the film's moralizing is, it's still a compelling heist. The story remains gripping throughout the entire two-hour-plus runtime, particularly during the second half, when the protagonists are torn between greed and survival. Special credit goes to composer Disasterpeace, whom audiences may remember from the It Follows score. His eerie tones and sinister build-ups give the film a moodier tone than your average shoot-'em-up, and are a lovely complement for the gorgeous rainforests and spectacular Andean vistas. So even if the characters' self-righteousness is a bit unconvincing, that's part of the point — since Triple Frontier shows how even the most virtuous intentions get tainted by greed.